Iona Blog : Perfect foundation for up to 15 hours?! Really? Better late than never hey, I've now been using the much hyped new Benefit primer 'Stay Flawless' for a whole month, it's no secret that I am a lover of Benefit products, my go-to everyday foundation is Hello Flawless and I love love love They're Real, Cha Cha Tint and Sunbeam, sadly Porefessional and I never really hit it off, so I wasn't much of a fan of Benefit primer, up until now that is! This post isn't my full review as I'm going to take a picture every hour on Wednesday (my longest working day, I put my makeup on at 6am! And don't get home till after 8, and that's if I'm not going out after work...) when I'll show how well it stands up to my long days! I was lucky enough to be invited along by the lovely BeneBabes to the launch of Stay Flawless at Bar Hema in Edinburgh (where we had the Scottish Bloggers Speed Dating) I headed straight there after my first day at my internship for a lovely evening of prosecco, Swedish canapes, make-up and catching up with some of my lovely blogger friends, perfect right? I don't know if I've got some Swedish ancestry somewhere (as I'm often asked if I'm Scandinavian, especially when I'm travelling, before people have heard me speak...) but I love Swedish food; the canapes were amaze! Happy Iona indeed. I did take photos of my pristine unused Stay Flawless, new foundation brush and Hello Flawless foundation on my camera, however as you may know my old memory card went kaput... good bye pictures... Though I will retake some for the 15 hour super long day photo post, look out for that over the next week! it works, trust me I've put this to the test! demonstrating how to use Stay Flawless. 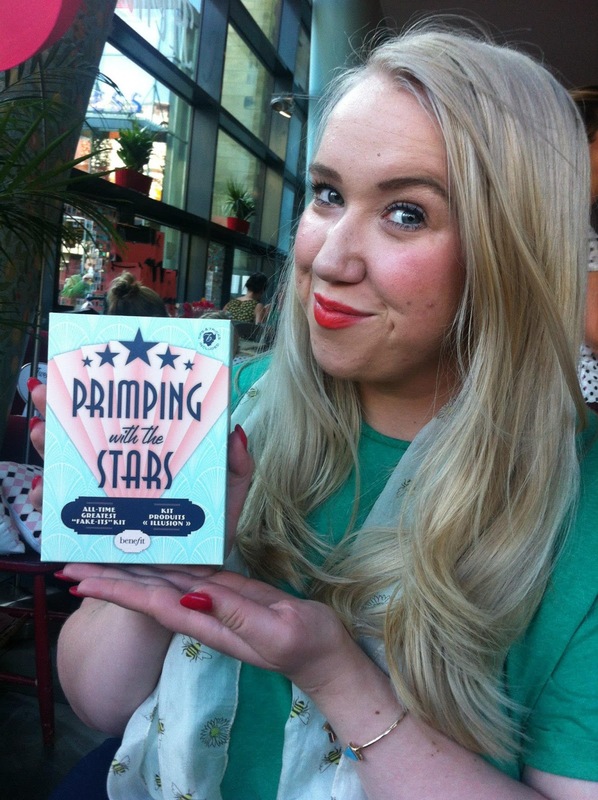 In a nutshell I love Stay Flawless, I'm so happy I've finally found a primer that works with my incredibly fussy skin and I'm so thankful to the amazing Benebabes for not only having me along to the event, feeding and wining, and sending me home laden with beauty products a plenty! I won the 'Primping with the Stars' kit in the quiz about Stay Flawless and I've already added a couple of the miniature items from it to my 'to-buy' list. Anyways I'm off to bed, as I've a long day of serving Sunday shoppers tomorrow and must get my 'beauty sleep'. Stay Flawless is now available in all Benefit boutiques nationwide and online; £24.50.